We are pleased to announce that Evan has reached his £3000 target. 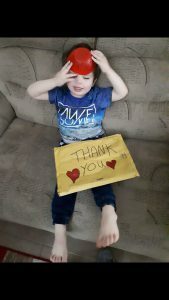 Evans family have been fundraising for the last months to get Evan specialised equipment to make his life a little bit easier. This equipment is not available on the NHS, so we set up a campaign to help family and friends. We organised fundraisers from the area to help Evans team and after only a few short months, we can finally announce his target has been reached and Evan will get the equipment he needs. Evans family wish to thank everyone who helped him achieve his goal.